Since Apple has renamed iPhone OS 4 to iOS 4, we thought we will update our jailbreaking guide for iOS 4.0 for both iPhone 3G and iPhone 3GS. 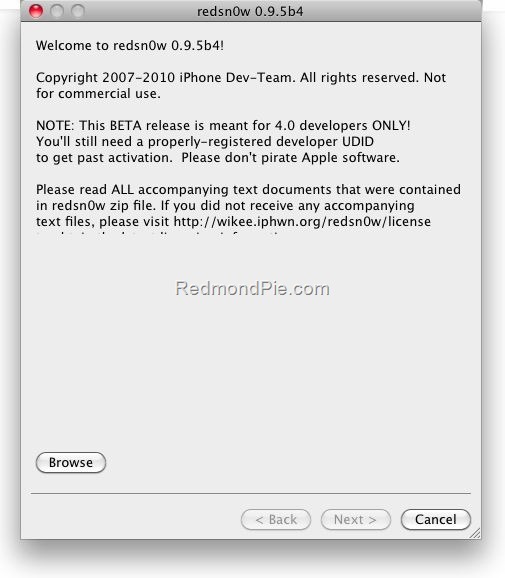 The redsn0w 0.9.5b4 which was released for iPhone OS 4 Beta 4 (now iOS 4) will need an update to work with this version of iOS 4. But the instructions to jailbreak would remain the same. We will let you know as soon as an update is available. UPDATE 1: The iPhone Dev Team has confirmed that the current version 0.9.5 of Redsn0w is can jailbreak iOS 4 GM on iPhone 3G. Download link here, and instructions are posted here. UPDATE 2: You can now jailbreak iPhone 3GS on iOS 4 GM using PwnageTool Bundles. More info can be found here, complete step by step guide can be found here. UPDATE 3: Final version of iOS 4 has been released. You can jailbreak iPhone 3G (any baseband) and iPod touch 2G using Redsn0w 0.9.5b5-2. Download Redsn0w 0.9.5b5-2 for Windows and Mac, and then follow Step 1 to Step 7 posted here to jailbreak iPhone 3G and iPod touch 2G. You can unlock it (including 05.13.04 and 05.12.01 basebands) using Ultrasn0w 0.93 guide posted here. Yea, regretting that I restored to the GM seed yesterday. Nothing really new or better on my 3G which was previously jailbroken on OS4 Beta 4. Once again, I lost wallpapers as Apple still is NOT including wallpapers on the 3G… LAME!!! how did you manage this? I tried it and redsnow says it is unable to recognize the ipsw! Please let me know if i'm missing anything. Will theyre be an unlock for iOS 4? and i did some research i can fix it but i have to get on cydia but how the FUDGE? do i get on cydia if i dont have any wifi or internet. I used cyder but it didnt work anyways. say theres an unlock and jailbreak for iOS 4 heres my fear what if my wifi still doesnt work when i jailbreak it? i wont be to unlock it and i wont be able to use iphone for tmobile. How come no one hasnt made an unlock for 3.1.3? just one click and boom. Will theyre be an unlock on june 21 when the iOS 4 comes out? would it be easy to do it just a click? 1 minute ago – 4 days left to answer. Redsn0w 0.9.5 is telling me that it doesn't recognize the ipsw file iPhone1.2_4.0_8A293_Restore.ipsw. Rather than just saying that you can do it, how about telling us how it can be done? Once it's jailbroken you can enable both wallpapers and multitasking. There are instructions to do both, just google them. Does “update 3” mean I can update my 3G to iOS4 and then JB using the existing tools + get my unlock? Where would I find that? The only ipsw file present in iTunes is the one that I cited. My firmware file (iPhone1,2_4.0_8A293_Restore.ipsw) isn't recognized either, though I'm not sure if it's because my phone won't make it to the activation stage (I have the “SIM card not supported” problem) or for some other reason. correcting my reply_ jailbreak with latest redsnow 0.9.5b5-4, it should fix every bug. hey, sorry i dont have an answer to your question, but i have the same wifi problem and cant figure out what to do to fix it! my 3g does work though so i can get to cydia that way. what do i need to download to fix it?????? i have had the same prob with redsn0w not recognizing my ipsw file, is there a way to fix that!? It seems like you have to wait.. I don't know how long but it will be out soon. how long do u think this will take? will the jailbreak work for iphone 4? if you need to downgrade the firmware found here all firmware for iPhone, iPod and IPAD. I need this answer as well! My wifi doesn't work either 🙁 I jailbroke and unlocked my 3g iphone (os 4.0.1) and now the wifi stopped working, in fact it does not detect any wifi connections. Is there a fix? me too, wifi doesn't work, but I can go into cydia via 3G, what do I need to install? Try go to ( Settings, General, & Reset ) ( Reset Network Settings ) it will reboot it back and it should go back to normal and working.